This is a very hard time of year for me. I am still very much dressing for the summer temps, but my mind wanders to Fall. Right now I'm craving this interesting maxi dress from Urban Outfitters, but at the same time a few long sleeved items including this Zara Fantasy Blazer (on sale) I've been debating over for months now and these adorable tops from Old Navy. By the way, as of today these tops are only online and not in the State Street store. Dressed for one of those hot nights out on the patio with the yoga girls at 3 Aces! 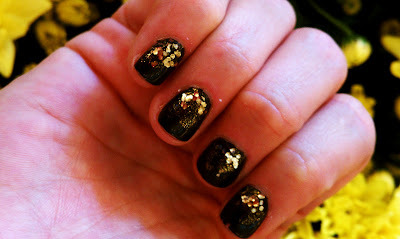 Ulta dark blue polish, fine gold glitter on the bottom half of nail and chunky gold glitter close to the nail bed for a fade out look.